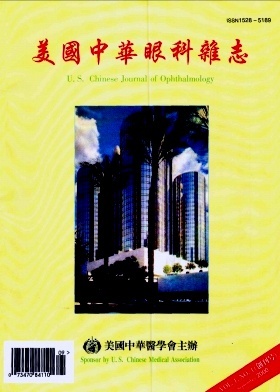 Clinical observation on combined cataract and glaucoma surgery in the elder Yuncheng Zhang, Ming Ai, Liqing Gong. Department of Ophthabnogy, First Affiliated Hospital, Hubei Medical University Wuhan 430060, China. Analysis of varying - sized internal sclerostomy in trabeculectomy Su Liu, Yongoqiang Tang. Second Hospital of ChongQing Medical University, Chongqing 400010 China. A randomized, prospective study on the use of Sodium Hyaluronate combined with Methylprednisolone in trabeculectomy HongjunLu, Gongzu, Lei, Wenmin Guo, et al. Department of Ophthalmology, Workers' Hospital , Xi' an Rolling Stock Factory, Xi' an 710086, China. Acomparative study of MMC and Mc in antiglaucoma trabeculectomy Yiyong Tao, Songhai Zhang, Zhaorui Liu . Department ofOphthalmology, Jinan Railway Locomotive Hospital. Jinan 250001 China; Department of Ophthalmology, Fifth People' s Hospital, Jinan 250000, China. Use of votex vein and long posterior ciliary artery in location of intraocular foreign body Xiaoli Meng, Yuying Wang. Department of Ophtiialmology Provincial Hospital, Jinan, Shandong 250021, China. Clinical study of conjunctival - limbal epithelium autograft and amniotic membrane trasplantation in treatment of pterygium Danfu Cheng, Hui Shen, Fengxian Liu. Department of Ophthalmology, Rizhao People' s Hospital, Shan Dong privince 276800, China. Combined Treatment of Chronic Dacryocytitis Jianying Wang, Hying Zhang, Xiangqin Zhao, et al. Eye Hospital of Xingtai, Hebei 054001 China.